By day, Bernard Matatumua-Vermeulen is a Soil Conservationist with the USDA Natural Resources Conservation Service (USDA NRCS) in Kealakekua — and in his spare time he is one of the green thumbs behind a food forest project at the Kona Seventh Day Adventist Church. The church is adjacent to the Amy B.H. Greenwell Ethnobotanical Garden in Captian Cook and is located in the kaluulu — a 18 mile-long breadfruit grove that was for centuries an abundant food producing region in Kona. Bernard is from Samoa, and the revitalization of the 3-acre property, which is also the home for the Kona Adventist Christian School, is a reflection of a multistory cropping system typical to his homeland and pre-contact Hawaii. Breadfruit, banana, sweet potato, taro, squash, fruit and nut trees are all growing harmoniously in a densely planted system. “We are doing all of this for the school and the community,” Bernard said. The Kona Adventist Christian School is integrating growing, harvesting and healthy food preparation into its curriculum. And they plan to have abundance to share with those in the community who don’t have enough to eat. On Sunday, April 22, in celebration of Earth Day, Craig Elevitch and Andrea Dean, representing the Hooulu ka Ulu — Revitalizing Breadfruit project planted an ulu tree with members of the church. The Hooulu ka Ulu project donated two trees to the church to kick off a series of tree plantings at churches that value and can care for breadfruit trees. 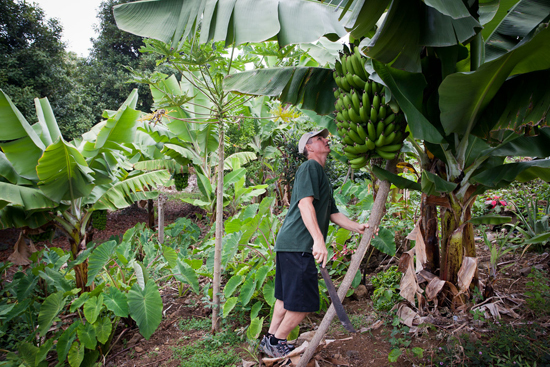 It was also the day of the first fruit harvest at the Kona Seventh Day Adventist Church and Pastor Luis Camps blessed the first bunch of bananas to come from Bernard’s plantings as well as blessing the new trees.